According to Anthony M. Snodgrass, a Laurence Professor of Classical Archaeology at Cambridge University, boar’s tusk helmets were common during the so-called Shaft-Grave Period of the Mycenaean era, around 1600 BC. The era marks the transition from the Middle Helladic to the Late Helladic periods and it was an incredibly important time of development in Greece. In his book Arms and Armor of the Greeks Snodgrass uses archaeological and cultural evidence to piece together a picture of ancient Greek armory used from the Mycenaean period up to the campaigns of Alexander the Great. 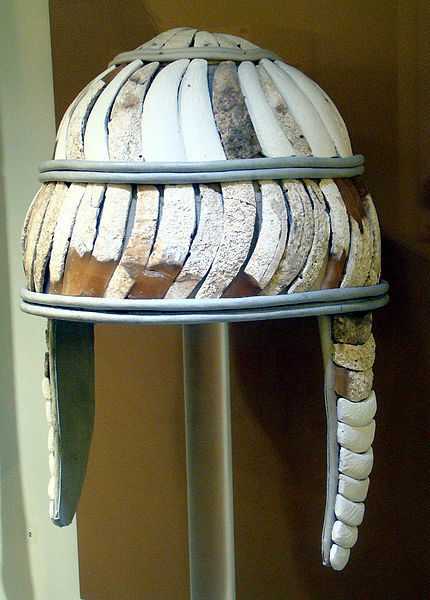 Many sites of a much later age, where this type of helmet has been discovered, indicate that the boar tusk helmet continued to be popular for ceremonial or decorative use years after they were worn in actual battle. The helmets were made using slivers of boar tusks that were attached to a leather base padded with felt, in horizontal rows (from two to five). The upper plates had a triangular shape, while on the top of the helmet a circular button made of ivory or bronze was placed and was sometimes used as a crest holder. 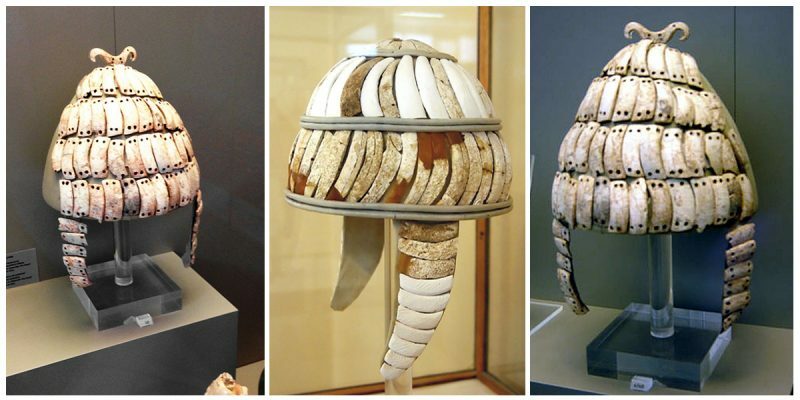 Helmets using ivory from boar tusks date from the Shaft-Grave Period (Mycenae) to the 10th century BC (Elateia, Central Greece). Author: frankfl – CC BY 2.0. Such tusks would have been available in abundance since these warriors regularly participated in boar hunts. It has been estimated that 40 to 50 boars would have to be killed to make just one helmet. The most elaborate examples were probably worn by high-ranking warlords. Some of these unique helmets were decorated with a crest, horse tail, or horns, and sometimes the front and back was adorned with various materials, in most cases probably feathers. 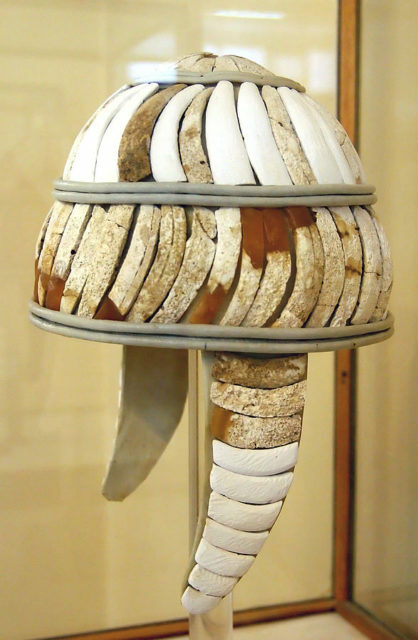 A leather helmet covered with two rows of boar tusks from the tomb at Katsambas. Heraklion Archeological Museum. Scholars believe that they may have been worn by leaders as a status symbol or a means of identification. Author: O. Mustafin – Public Domain. 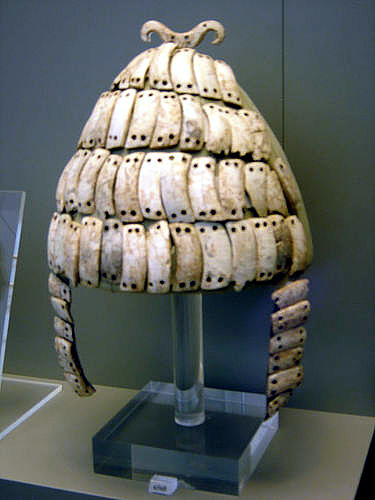 The usage of ivory as a protective or decorative element in several types of Achaean helmet is well verified in several images as well as findings. These helmets are mentioned multiple times in Homer’s epic poems. One example is in book ten of Homer’s Iliad, when Odysseus was armed for a battle against the Trojans and Meriones gives him a helmet made of leather with rows of white shiny tusks from a boar. Homer even suggests that boar hunting was a part of the warrior culture. Some of the helmets were decorated with crest, horse tail, horns and sometimes equipped with neck protection and cheek guards. Boar’s tusk helmet with cheek-guards and a double bone hook on top. Mycenae, Chamber Tomb 515, 14th – 13th century BC. On display at the National Archaeological Museum, Athens. Author: Dimitris Kamaras – CC BY 2.0. The Iliad was largely believed to be a story that belonged to myth and legend until Heinrich Schliemann, a German businessman and a pioneer in the field of archaeology, found pieces of a Trojan helmet’s crest, probably dated around 2000 BC, in a room of the palace in the Hisarlik hill settlement, generally agreed to be the site of ancient Troy. 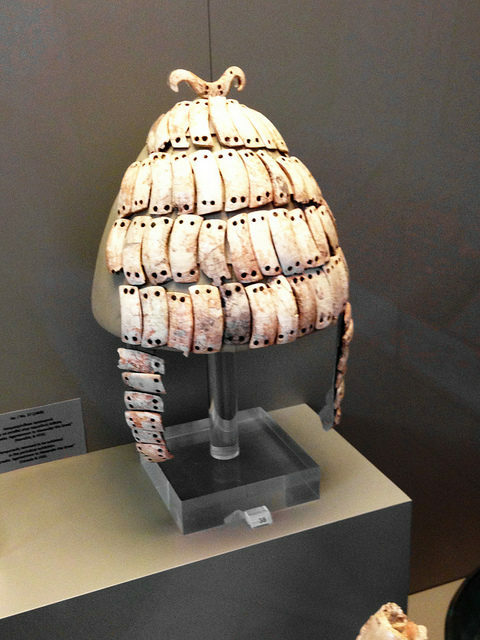 Boar’s tusk helmet, Heraklion Archaeological Museum. The number of plates required to make an entire helmet varies – anything from 40 to 140. Boar tusks more likely used as reinforcement or decorative elements of a cap-helmet. Author: afrank99 – CC BY-SA 2.5. Schliemann, along with Arthur Evans, was a pioneer in the study of Aegean civilizations from the Bronze Age and excavated a number of sites in Greece and Turkey which caused an international sensation. By introducing these boar’s tusk helmets with bronze cheek plates, more light is shed on the development and chronology of these very first European bronze helmets.